If, like some reality TV judges, you appear to like your Wellingtons to be ‘cow-ed and bloody’ then this post may not be for you, since it describes the development of my veggie Wellington. I can’t give you the full recipe as it has been printed in this book. Mary absolutely adored it and insisted it was included, along with Ryan’s key lime pie which I never got to taste, but is on my future bake bucket list. I have a copy of the book and as it is so heavily discounted online at present it’s probably worth a punt (or Euro/Dollar). It was a lovely surprise to receive the news about Mary’s decisions and something a TV audience is not given details of. I’ve indicated before that the cutting room floor contains considerably more to the story, as does a contestant’s email inbox the week after filming, as requests for recipe revisions come through and there is a growing realisation that the previous round’s baking was actually more successful that might have seemed at the time. This episode of Bake Off has led to a deluge of emails and twitter comments on the perceived bias of Paul’s judging towards certain contestants but this article today by Xanthe Clay railing against the culture of TV gastronomy as sport, also puts the GBBO into a different perspective for the audience. This series is about instruction and encouragement and I cared not then (as now) whether any judge likes me since that wasn’t why I was there. I was getting feedback that was useful, albeit in extremely stressful and trying circumstances at times. The questions that are not asked are sometimes more interesting than those that are, and this article when a newspaper crew accompanied us that weekend speaks volumes of the investment we were all making at that point. 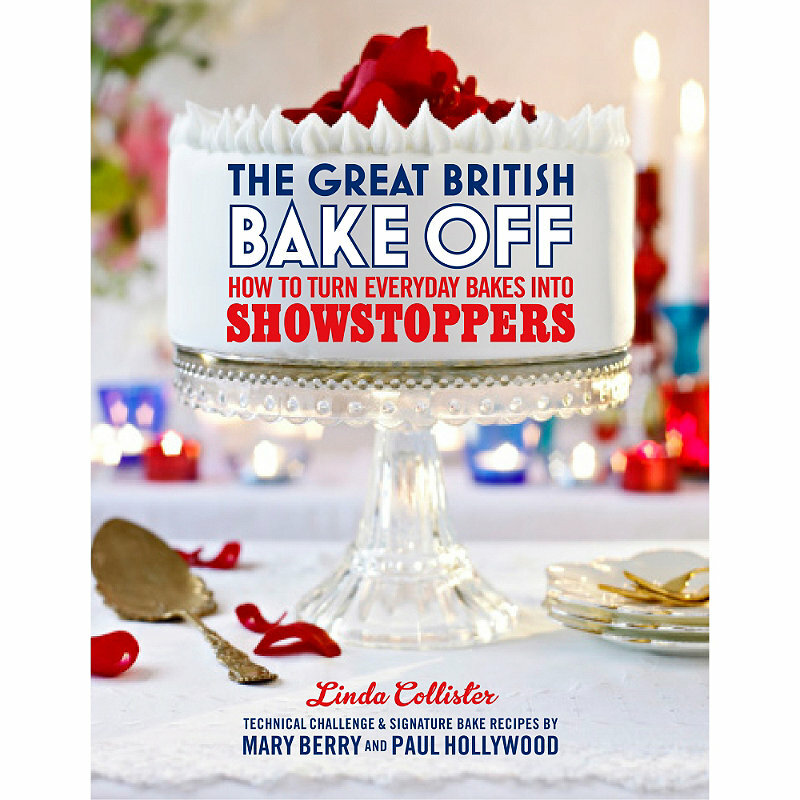 The value of GBBO for any contestant is what you learn along the way in developing recipes and bakes and the expert feedback you receive. 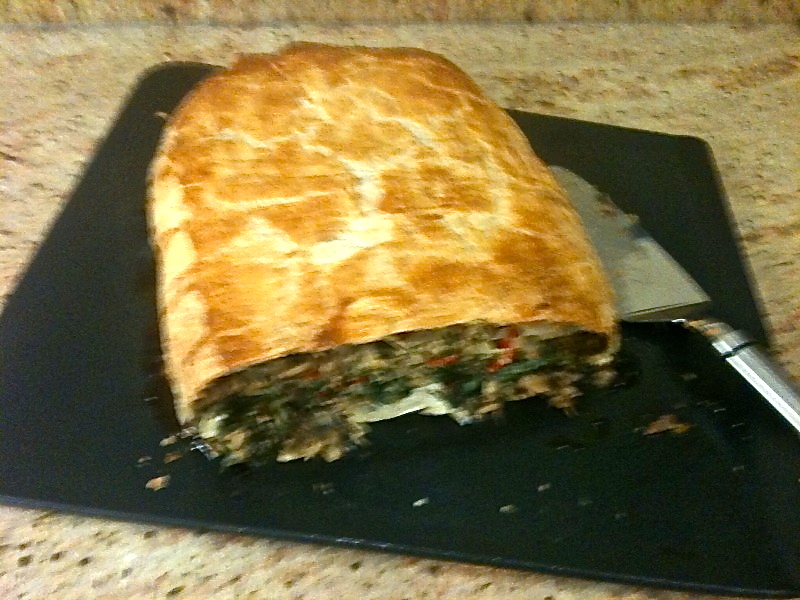 For me the journey of developing a veggie Wellington was the important thing. Most vegetarian Wellingtons are dry, glorified nut roast affairs and do nothing to help the reputation of veggies as humourless anorexics prone to hanging around the lentil bargain bucket bins in health food stores. My veggie ‘Boot’ started life as a regular filling for one of my winter pies, so all I had to do was learn to put it in a Wellington format. The pie filling itself came about from rooting around the contents of my fridge and cupboards trying to use up all the odd bits and bobs, hence the “half of this, half of that” quantities list. Learning to get that list of bits and bobs into a Wellington turned out to be harder than I first appreciated and I have every sympathy with Manisha’s soggy pastry and Sarah- Jane’s gynaecological exposure- both of those are common failings. For a veggie Wellington you need a filling that holds together so it can be rolled and chilled like a piece of meat. This is why this filling works. Paul wanted it to have something ‘meaty’ running through it, which he later clarified as ‘like a mushroom’. So in the absence of a foot long rectangular fungus, you could try some lightly grilled/sauteed portobellini mushrooms running through the centre of the filling (I’ve not done that, but I would give it a go the next time I do this just for a change). As the filling is moist you need something to roll on and around it, to hold it together and protect the pastry from getting soggy. I used 4 herb pancakes arranged on the pastry and then spread with a mushroom duxelles (or mushroom pate if you prefer) to ‘glue’ the pancakes to the filling. Others last night used meats like parma ham to do a similiar job. Your filling must be well chilled and the pastry rolled and sealed properly otherwise seepage occurs. The best instructional clip I’ve seen on how to do this is Gordon Ramsey’s salmon en croute instructional video but do note Gordon isn’t using pancakes as he’s using shortcrust pastry and the salmon won’t leak as much liquid so he can get away without. So here it is, a guide to how you might want to use a filling like this with some herb pancakes and puff pastry (I used my usual rough puff as described in an earlier blog) to make your own. I’ve also added a recipe for a green mustard yogurt sauce which goes well with the Wellington if you’re eating the leftovers cold, although it does need the Maille brand of green herb mustard to make the sauce properly. Ordinary mustard doesn’t seem to work. Chop onion and mushrooms as finely as possible in a food processor, and add to the melted butter. Season with salt, pepper and nutmeg then cook the mushrooms and onion uncovered over a low heat until all the liquid has evaporated and they have reduced down. Chill in the fridge if possible when cooked. Heat the oil in a large open frying pan or wok over medium heat. Add the garlic, onion, red pepper and chilli and cook for 3-4 minutes until soft. Add the cumin and coriander seeds and cook for 5 minutes, stirring intermittently. Add spinach and cook for 5 minutes, stirring until all the spinach is wilted. Remove from heat and transfer the spinach mixture to a large bowl. Add the chickpeas, tahini, breadcrumbs, lemon juice, yoghurt and herbs. Add salt and cayenne pepper and mix well until all the ingredients are combined. Leave to cool in the fridge to harden whilst rolling pastry. Press the hard boiled eggs through a fine sieve and add the mustard. Whisk together until combined. Gradually stir in the yoghurt and add paprika, lemon juice and salt. Serve with Wellington and around it. Roll out the pastry on a lightly floured board into a rectangle approximately 40 x 25cm. Place 2 pancakes side by side and slightly overlapping and use the remaining pancake to fill any gaps and make a rectangular type shape lying the pancakes on baking paper/parchment. Cover the pancakes with the mushroom duxelle leaving a 2cm gap at the edges. Arrange the chickpea mixture in a sausage shape in the centre of the pancakes and fold the ends and sides of the pancakes up to cover the mixture. Use the baking paper to draw the edges together and make a firm log shape. Transfer the pancake rolled mixture in the centre of the pastry and tuck the short ends in to seal the filling. Ensure the loose ends of the pancake log are face down on the pastry. Brush the sides with beaten egg. Bring the longer sides up to cover the pancake filling, again brushing with egg to seal and trimming off excess pastry at the corners. Save the trimmings to decorate the Wellington rolling them out thinner and cutting leaves to arrange down the centre of the Wellington. Place the Wellington folded edges down onto a baking tray with baking parchment on and chill for as long as possible before baking. Brush pastry with eggwash and bake in the centre of the oven for 40 -50 minutes (my oven needs 50 usually). 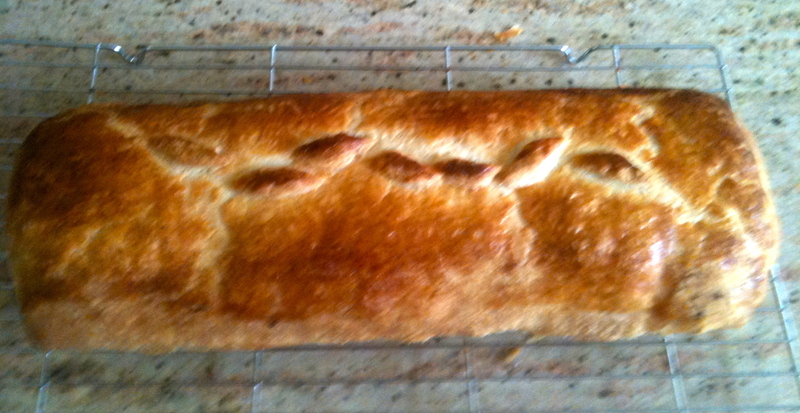 This entry was posted in GBBO, Recipes, Tips and tagged herbs, pastry, puff pastry, spices, tips, vegetable, vegetarian. Bookmark the permalink. I’m so happy that your recipe is in the book! Last night was the first time Paul has ever annoyed me – how can such a professional dismiss a vegetarian recipe for being just what it is? Well ultimately when the standard is so high from my fellow competitors Sarah, it will come down to personal taste of the judges, as there was rarely much difference in the quality of our bakes. Thankfully there are 2 judges with differing tastes so there was often discord in their opinions. We were all chasing the ‘Holy Grail’ of positive comments from Paul and Mary. It didn’t happen often, but I think all of us got that at some point, and it doesn’t half make you feel good about your baking when you do get that! Your wellington was the best simply because it was vegetarian! I didn’t like watching the raw meat. This would be a brilliant idea for Christmas dinner – veganised for us though. I’ve cooked it a few times Carolyn and agree it would work for a veggie/vegan special lunch. I’ve known quite a few avowed meat eaters say they liked it too. Must be the idea of pie..!! 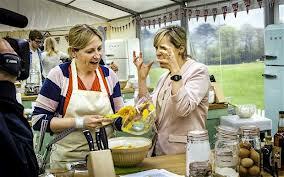 Thank you so much for cooking this on GBBO – and for not thinking all vegetarians are humourless! Having been a vegetarian for 25 years, I have come to realise there are two ‘audiences’ for veggy food: meat eaters (who often need some compensation for the fact they aren’t eating meat) and vegetarians, who don’t! Perhaps in the absence of the strong textures and flavours of meat, veggies become more sensitive to the different tastes and textures of vegetables, pulses, etc? Anyway, thank you. I don’t cook or bake much myself and frankly the length of this recipe is terrifying, but I am tempted… PS Both my husband and I enjoyed watching you bake and thought you were a great demonstration of intelligence and decency under fire. All the best. Thank you for your kind note- I think after a long time not eating flesh veggies do notice different tastes. I have made this for some meat eating neighbours recently and they loved it, so it was good to challenge their thoughts that all veggie food is bland. If you don’t fancy making the whole thing you could put the filling into little parcels of film pastry- I think that might be quite nice too and a lot less hassle! Well I made this for Christmas dinner and it was delicious. Thank you for the recipe – it’s definitely going into my recipe file. I didn’t make my own pastry – JusRol makes it just fine for me 🙂 I also didn’t put any chilli in because a) I didn’t have any and b) I don’t like it anyway! It didn’t miss it. Glad you liked it. I made it for some non veggie friends who were having a dinner party and they loved it too. Hope you are having a good Christmas.